From the Spring 1946 "Originator" (Volume V) is this design inspiration for trimming with fringe and pleating. For myself, I like the pleating more than the fringe. The 3/4-length sleeves of the jacket are rather chic with their French buttoned cuffs. The Originator is a rare series of booklets that describes itself as providing "unique fashion hints, modern trends, and ideas with variations smartly and practically applied." Fashion editor for this volume is Florence Hort. The company (Originator Publishing Company) was based in New York and began in the fall of 1945, lasting until the early 1950s. It provided current fashion sketches and prided itself on forecasting fashion trends and being a handbook of new ideas. 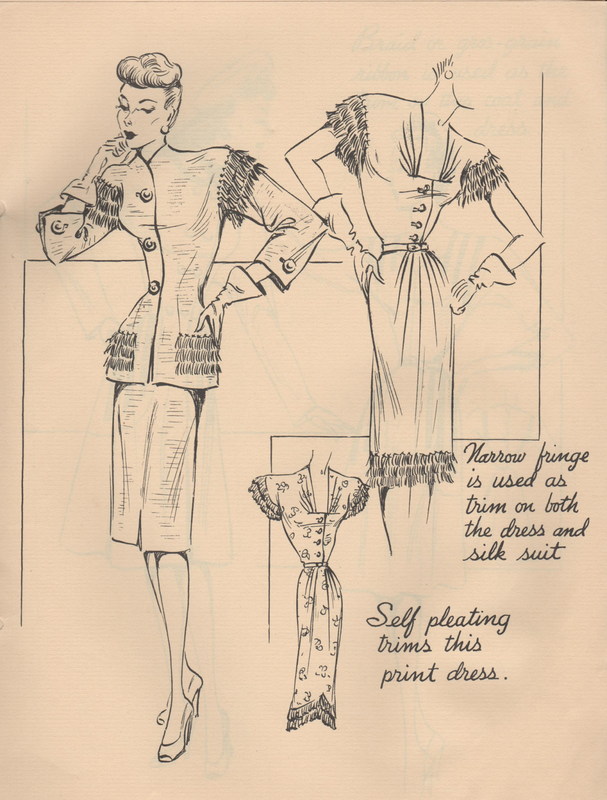 The company did go on to publish sewing patterns, which are even rarer than the booklets.